DAMN is excited to host the arts and creative entrepreneurship workshop with Leah Edwards, former Director of the Center for Entrepreneurial Studies at Stanford B-School. A serial entrepreneur who launched an art gallery and directed educational outreach at Autodesk, Leah's career now focuses on helping artists succeed in an ever-changing arts ecosystem. After earning a BS in Finance from UC Berkeley and an MBA +Certificate of Public Management from the Stanford Graduate School ofBusiness, Leah had a successful career as a co-founder of technologycompanies. Beginning with a $380 million sale of the first company sheco-founded, Leah has co-founded or coached numerous technology andsustainability companies to successful sales. 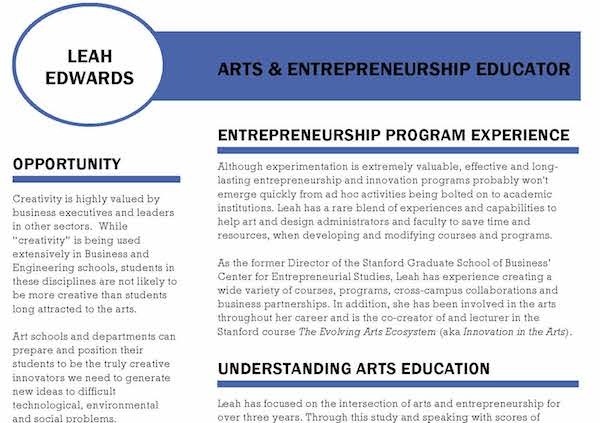 Leah then served as theDirector of the Center for Entrepreneurial Studies in the Stanford GSBand is now teaching at and consulting to universities nationwide.